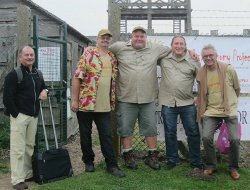 International SUNday Daventry UK 2017 - SolarChat! Evening all, Great outreach event on Sunday for SUNday in Daventry as part of Daventry arts festival, here is a time lapse that Tich did for the day. Skywatcher ED80 Pro Apo Refractor + White light with Lunt 2" wedge. Philips SPC900NC mono chip webcam. + Collection of Vintage Hawaiian Ukuleles. Good stuff Richard! Well done!